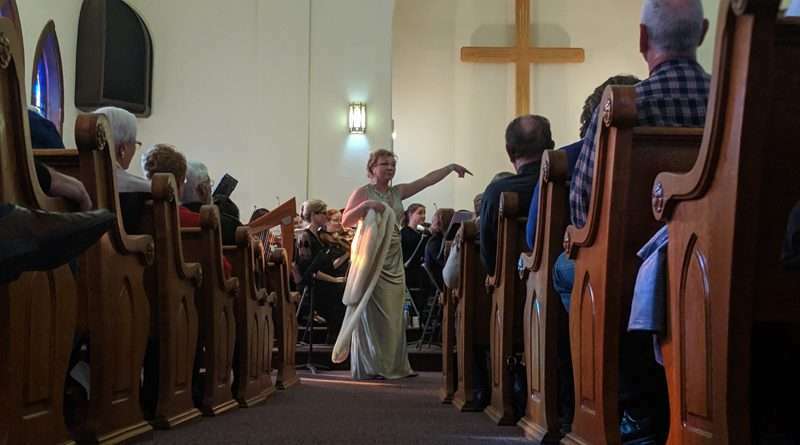 The Susanville Symphony once again dazzled the audience of Lassen County with its array of grand pieces, special guests and the debut of the United Methodist Church’s refurbished organ. The church’s pews were packed with not only warm bodies, but with familiar sounds to opera aficionados. The symphony also filled the room with goose bumps and, at times, even laughter. A frequent component of the symphony’s concerts, Liudmila Mullin, dazzled the audience with her dramatic and composed conviction — and her always-impressive voice. Her costume choices were superb and sensational. Mullin, in performing “Voi lo sapete, o mamma,” emoted on-point visceral desperation while gently but firmly punching the high notes with grace and a silken vibrato. Mullin’s last piece, “Ah, que j’amie les militaries,” the first aria the opéra bouffe (a form of light opera) “La Grande Duchesse de Gerolstein,” showcased Mullin’s range as a performer. Which, in comparing her first performance, shows it is quite impressive. The special guest Kolby Van Camp shared his humorous beginning encounters with symphony conductor Ben Wade. He also shared the serene and meditative experience of watching and listening to the Kansas cornfields in the wind. The concert’s overture pieces gave listeners a chance to reintroduce their ears to rich and moving sounds, familiar yet new, given the live performance. The Barber of Seville and William Tell overtures stirred up concertgoers’ nostalgia, whilst the concert’s final piece showcased the organ, played and introduced by Dennis Roberts.